FREE CHRISTMAS EBOOK FOR KIDS FROM OTTO FISHBLANKET! Well. Another day, another update from Otto Fishblanket's publishing empire! I have again exceeded my own expectations. I am now having my Rolls Royce goldplated. To celebrate this milestone in my self-publishing success, I will be offering an early Christmas gift! Tomorrow, Monday 17th December, for one day only, Stinky Santa will be free! Save 77p (or 99 cents)! It won't be offered for free again until next Christmas! No news on my chickens book yet. I am awaiting a visitation from my Muse. That is how it works. I am merely a conduit. There will be no update from me tomorrow, as I am going to the cinema with Mousington and Lord Treacle to see the new Hobbit film. 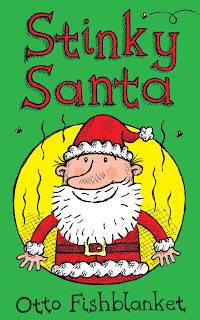 Click on the cover to be whisked off to Stinky Santa's home on Amazon.com! Three 5 star reviews on Amazon.co.uk! Stinky Santa Christmas ebook for kids!